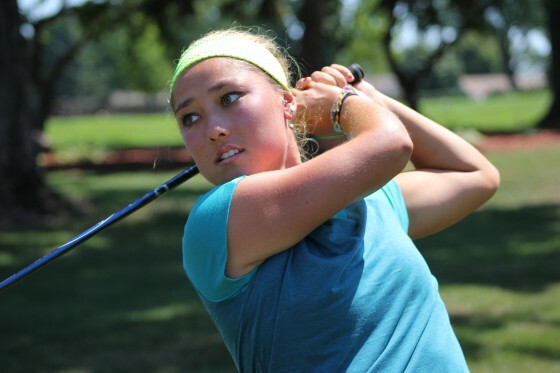 LINDEN – Last August Muskegon’s Aya Johnson had surgery to repair a herniated disc in her back that she suffered while lifting weights with her golf teammates at the University of Wisconsin. Playing in what she described as constant pain, she made five birdies Wednesday in the round of 32 at the 100th Michigan Women’s Amateur Championship, held off Lily Pendy of Grosse Pointe Farms and Ohio University 1-up with the final birdie on the 18th hole, and is part of the celebrated “Sweet 16” still playing at Spring Meadows Country Club. Johnson is one of 10 collegiate golfers in the final 16, which also includes five high school golfers and one 44-year-old golf coach. Anika Dy of Traverse City, a two-time finalist in the national Drive, Chip and Putt at Augusta National Golf Club, is the youngest golfer remaining in the field at age 15, and the 44-year-old coach is Michigan State University’s Stacy Slobodnik-Stoll, a two-time state champion (1996, ’98) and the winningest amateur golfer in Golf Association of Michigan history with 15 titles. The round of 16 and the quarterfinal matches are scheduled for Thursday with semifinals and the championship match slated for Friday. Johnson, 20, will meet Nichole Cox of Empire, a 17-year-old senior-to-be at Maple City Glen Lake High School in the morning, and is not sure what playing another match in the afternoon quarterfinals might mean if she wins. Johnson said her 1-up win over Pendy was a grind for her, but great golf with both players trading birdies to the very end. Johnson, a communications major who will be a junior in the fall at Wisconsin, said she wants to finish out her college golf career. Defending champion and top seed Allyson Geer of Brighton advanced with a 4 and 3 win over Natalie Johnson of Clinton Township and Central Michigan University. She will play another Brighton golfer, Hannah Pietila, Thursday morning. Pietila, who will be a senior at the University of Tennessee, topped Sarah White of Kentwood 2 and 1 in a first-round match that featured 2015 semifinalists. No. 2 seed Emily White of Saline and the University of Michigan, beat Elle Nichols of Okemos and Oakland University 5 and 4. She will run into Julie Guckian of Linden, the hometown favorite and member at Spring Meadows in the round of 16. Guckian, a Grand Valley State golfer and the 2015 GAM Women’s Champion, beat Katelyn Chipman of Canton 2 and 1. Cordelia Chan, 19, Birmingham, sophomore at Williams College (Mass).